Salman Rushdie's most ambitious and accomplished novel, sure to be hailed as his masterpiece. At the beginning of this stunning novel, Vina Apsara, a famous and much-loved singer, is caught up in a devastating earthquake and never seen again by human eyes. This is her story, and that of Ormus Cama, the lover who finds, loses, seeks, and again finds her, over and over, throughout his own extraordinary life in music. Their epic romance is narrated by Ormus's childhood friend and Vina's sometime lover, her "back-door man," the photographer Rai, whose astonishing voice, filled with stories, images, myths, anger, wisdom, humor, and love, is perhaps the book's true hero. Telling the story of Ormus and Vina, he finds that he is also revealing his own truths: his human failings, his immortal longings. He is a man caught up in the loves and quarrels of the age's goddesses and gods, but dares to have ambitions of his own. And lives to tell the tale. Around these three, the uncertain world itself is beginning to tremble and break. Cracks and tears have begun to appear in the fabric of the real. There are glimpses of abysses below the surfaces of things. 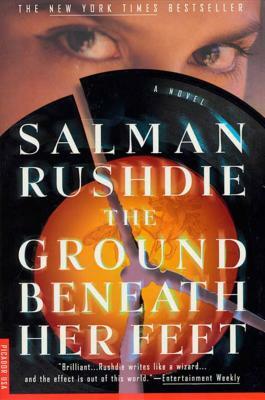 The Ground Beneath Her Feet is Salman Rushdie's most gripping novel and his boldest imaginative act, a vision of our shaken, mutating times, an engagement with the whole of what is and what might be, an account of the intimate, flawed encounter between the East and the West, a brilliant remaking of the myth of Orpheus, a novel of high (and low) comedy, high (and low) passions, high (and low) culture. It is a tale of love, death, and rock 'n' roll. Salman Rushdie is the author of several novels, including Grimus, Midnight's Children, The Satanic Verses, Haroun and the Sea of Stories, The Moor's Last Sigh, The Ground Beneath Her Feet, Fury, and Shalimar the Clown. He has written collections of short stories, including East, West, and co-edited with Elizabeth West a collection of Indian literature in English, Mirrorwork. He has also published several works of nonfiction, among them The Jaguar Smile, Imaginary Homelands, The Wizard of Oz, and Joseph Anton, a memoir of his life under the fatwa issued after the publication of The Satanic Verses.